Mises Institute: How did you become involved with this movement? Paolo Bernardini: I moved to Veneto, to the city of Padova (Padua), in 2001, as director of the Boston University Center for Italian Studies, a job I held until 2009. Over the course of eight years, I got involved with the local separatist movements, and at the same time I developed a strong interest in the libertarian and classical-liberal thought. So, now that I teach in Como, Lombardy, I envisage a similar future for Lombardy as well. In a certain sense, mine is a cold-blooded, economically-oriented separatism that I might well endorse/apply elsewhere, from New Hampshire to Catalonia. 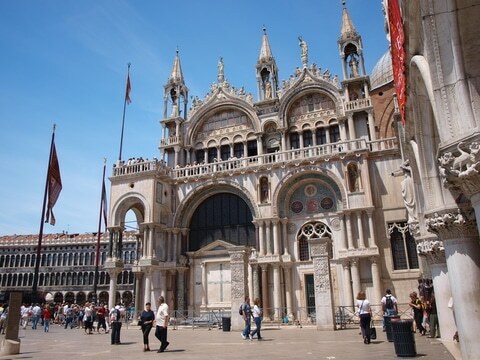 Of course, I also developed a love for the Veneto territory, people, and traditions. I spend most of my time in Venice, when I am free from work. I do not believe in “ethnic” nationalism as a primary factor for the establishment of new states that are also strong economies and globally oriented. MI: Were you pleased with the outcome of the referendum? What do you say to your critics who say it was not a fair or properly-held election? PB: Of course I was and am pleased with the outcome of the referendum. Now, the certification of the votes is ongoing, but it is a complex process that might involve some more months. It was a fair and properly-held election, only, it did not originate from any public source, contrary to what is going to happen in Scotland, on September 14th, and in Catalonia, on November 9th. It is a genuine expression of a people, and of a spontaneous committee who freely organized the referendum, so, in a way, it is a quintessential expression of sheer democracy. Moreover, the use of an electronic vote for political purposes of this scope is historically unique. Gianluca Busato, the leader of the separatist movement, and an engineer, deserves a mention in WIRED! for his skill in making it all work smoothly. Sardinia, Sicily, and Friuli have borrowed our know-how and are organizing similar referenda. According to international law, the right of self-determination is sacred, but there might be several ways to exercise this right, and, to make the existence of the will of a people to secede public and internationally acknowledged, is a first step. Within other separatist movements, such as “Indipendenza Veneta,” however, leaders are in favor of a “public” referendum, i.e., a referendum organized by the Regional Council, as is going to happen in Scotland and Catalonia. However, while the British do not have — thank God — a constitution, both in Spain and in Italy the respective constitutions forbid the separation of territories. This does not mean that peoples are deprived of freedom. Ideally, international law is a source of law superior to any constitution. A fortiori, natural law is such. Jefferson was so right in stating that constitutions have to be binding for one generation only! And for “generation” he meant 19 years! Peoples, and a fortiori, individuals, are live entities, cannot and may not be bound to dead letters. MI: What are the ideological origins of this movement and who else has been involved? PB: Plebiscito.eu (the organizaer of the referendum) has a very strong classical-liberal component, but there are also other components. For instance, economists such as Lodovico Pizzati, now at California State, Los Angeles, are in favor of the EU, and also of the Euro. But ideology, in a way, is less important than the final goal we set for ourselves: independence. When independent, Veneto will be a democracy and as such there will be competing parties trying to rule over the new state; many, including myself, envisage the creation of a Venetian Libertarian Party, for social-democracy in several garbs will try to gain power. Certainly, taxation will be lower than under Italian rule, whatever party will rule. Italy is a fiscal hell, no wonder that it is traditionally in the lower ranks of the Index of Economic Freedom. MI: What are the prospects for victory for secession? PB: I think that our prospects for victory are strong. A number of factors will play a positive role in the near future, I would say, from now to the end of the year. The Italian economic crisis will get worse. We are already witnessing the closure of thousands of businesses in Veneto (yesterday, Ideal Standard, a major company in toilet ceramics, laid off 450 employees); entrepreneurs kill themselves in the hundreds; young people migrate; unemployment reached terrible peaks; Italy is turning into a nightmare. Our votes, those of the referendum, will be properly certified, by an ad hoc committee. The certified results will be presented to the International authorities, organizations, etc. Scotland and Catalonia will have their separatist referendum. In the case of Scotland, now polls say that the “no” and “yes” are almost even. In the case of a victory of the “yes,” this will give an incredibly strong impulse to our movement. In Catalonia, the “yes” party is traditionally in the majority. The EU is in a great crisis, as it will be made clear by the forthcoming EU Parliament elections. The EU might have all the possible interest in keeping rich new states in the Euro-zone (as a libertarian, I am not pro-EU, but this is only my personal view), including Scotland, Catalonia, Veneto. Scotland might be a part of the EU when the rest of Britain — look at the great success of Nigel Farage — might go away from the EU. MI: How do you think true separation would affect the Venetian economy? PB: Over the long term, positively. Over the short-to-medium term, there will be a great popular enthusiasm, the sense of a new beginning among a frustrated, impoverished, disillusioned population. But, I suspect, there will be problems in the negotiations of the assets and debts with Italy. Veneto will probably have to take up some of the huge Italian public debt. In the case of Scotland, the problem will be shared per capita, or per regional income, in proportion with the national income? If per capita, Veneto will have less than 10 percent of the Italian public debt to take care of, on the contrary, if per regional-proportional income, much more than 10 percent. From my point of view, I see the public debt as something done only by Italy and to be left entirely to the Italian government, but this way of thinking would present a major stumbling block to a smooth transition. Veneto has to offer to the rest of Italy a “golden parachute” after it breaks away. MI: How do you imagine a new Venetian state would interact with the overall European community? PB: A tiny majority of Veneto people are in favor both of the EU and of the Euro as a currency. So I envisage a little, rich state, playing a major economic and political role in the EU, a stabilizing role. It will interact naturally with other rich and similar states, Bavaria (still part of Germany), Austria, and the Netherlands. It will be a Finland in the Adriatic. In general, however, new little states entering the EU in a position of economic privilege (Scotland, Catalonia, Veneto) should also be able to recondition the EU policies and even its nature. The EU is dangerously approaching the status of a dictatorship, it should go back to be a loose confederation of states providing the guarantee of a free market, a free economic space really open to the East. And nothing else. It is worth remembering that the Ukraine disaster is partially due to the EU sealing off its borders, its protectionist policies: and I refer especially to the Polish-Ukraine borders, and its acting with the cold-war mentality that is at the very origins of the creation of the European Community. It is also worth recalling that the best performing European economies are those of Norway and Switzerland, both independent states, without the EU or the Euro. Mr. Van Rumpuy does not like them, but the international markets do. MI: What steps has the Italian state taken in the wake of the vote to prevent Venetian secession? PB: Mr. Alfano, the Italian Minister of Interior Affairs, recently came to Veneto and stated: “Veneto is a major problem and needs a very advanced form of federalism.” What he meant is not clear, nor has any political action been taken so far, at the central level, to address the problem. Every time I hear the word “federalism” I am dismayed. A state is born federal, not turned to a federal commonwealth after it has been born centralistic. This is what history tells, and teaches. Look at the US. They were born free, for some happy years they were 13 free colonies, then they had the Constitution, the Civil War, the New Deal, the Wall Street collapse, all steps that made it more and more centralistic. Look at Switzerland. Until 1848 it was a real confederation. Then its 1848 constitution made it more centralistic, provided for a capital city, Bern, and some of the original freedoms of the Cantons (honestly, just a few) were forever lost. Italy was born stubbornly centralistic, it might have been different, there were champions, such as the Milanese Carlo Cattaneo and Giuseppe Ferrari, of a pure form of federalism. They lost. Now the time is approaching for the redde rationem. In comparison to Italy, the other major state born in the 19th century, Germany, is much less centralistic. Look at Bavaria, they keep most of their revenues at home. There is no separatism in Bavaria, at least no movements comparable in size and support to those in Veneto, or Lombardy, or Catalonia. When he was arrested and almost immediately executed, Robespierre was discussing with his team how to design the new letterhead of the official paper to be used by the Convention. I think of this when I see both mainstream newspapers and Italian politicians referring to us as “folklore,” to diminish us, without realizing what’s happening.